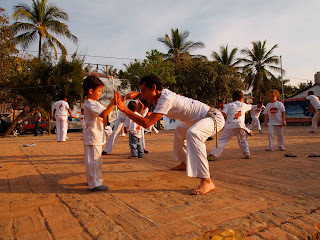 In Riviera Nayarit luxury is our magic, and for second consecutive year this magic has attracted the great capoeira masters, who will offer workshops, baptism ceremonies, rodas, and the culture of this popular and rhythmic martial art in San Francisco, Nayarit, on March 21 to 24. This time the event will assemble approximately 300 participants from all over Mexico, who are seeking to create partnerships to share the knowledge of all the Abadá Capoeira groups in Mexico, as well to strengthen environmental awareness and reaffirm the presence of Abadá Capoeira, which already has 100 local members. The rodas, the baptism ceremonies and the workshops will be led by the guest instructors and will try to promote Arte Capoeira as the main activity of this event, together with a series of workshops to grow organic gardens, in order to generate a greater environmental awareness among all participants. The Convention and Visitors Bureau of Riviera Nayarit realizes the importance of sports-based tourism as yet another aspect to attract tourists to our destination, and congratulates the organizers for their intense work and for contributing to the positioning of Mexico’s Pacific Treasure.